The video would not embed, but you can view it here. Bringing out the big ones here on the creepiness scale. 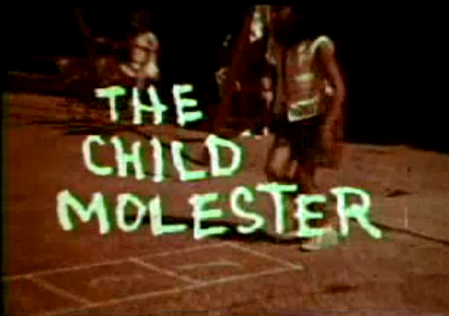 I originally saw the highly disturbing educational short “The Child Molester” as a bonus feature when I purchased the DVD of “Hell’s Highway”, a documentary on highway safety films (ie; Red Pavement, etc… we will leave those for another post). This particular educational film was geared towards a very young audience, much too young for the subject matter. This film does contain GRAPHIC CONTENT at the very end (aprx 18m into it). However, the reason I chose this short was the simple fact that even without the ending it would still be completely traumatizing to an 8 year old. It has every aspect of creepy. You’ve got your creepy melody and matching title screen right from the start, your typical mondo-era narrator pushing you along throughout the plot and all while playing through a 1960s film reel that looks like it’s been melting in a dungeon for 30 years. I understand wanting to warn children about talking to strangers, but this took it a bit far.